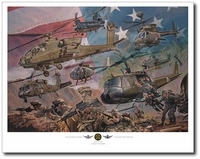 Anniversary Edition Size: 36" x 12"
MasterWork Anniversary Edition Size: 54" x 18"
"It's dawn in the central highlands of Vietnam," says William S. Phillips. "The air is heavy with the smell of rain and moist vegetation. The thunder of a passing monsoon rumbles through the mist-shrouded valley as a scouting platoon arrives on a rocky outcropping. "Soon, however, the tranquility of this seemingly pastoral setting is shattered by a new thunder� the sound of a long, green line of UH-1 Iroquois helicopters (Hueys) winding down the valley to a landing zone." The "Huey" was the chosen vehicle for the U.S. Army's Air Cavalry. It served as a troop transport, provided armed support and was used for casualty evacuation. In this painting, William Phillips, himself a veteran, pays tribute to the men who served in Vietnam and to the machines they flew.